Evolution is a subject that definitely causes a stir. It holds an overwhelming acceptance rate in the scientific community while its adherents make up only 39% of the American public.1 Ask about teaching evolution in schools and you will get a vast array of responses, some of which are very passionate for their positions. Even the way evolution is defined, as I've written before, is controversial. The term has been stretched and shaped to fit whatever its user hoped to prove. Much of the confusion and battle on this topic has to do with rebuilding models. All of the neo-Darwinian synthesis models rely on gradual changes over many millions of years, which means that one must infer what changes occurred and why. The evolutionary biologist inserts his own conjecture into his explanation because there is no way he could have observed the development of, say, a new species of homo from a more primitive ancestor. Observation and data could help remove some of the conjecture from what may have happened, but how could we get such data? That's why my next book in our list of Top Ten Neglected Books by Apologists is an important one. 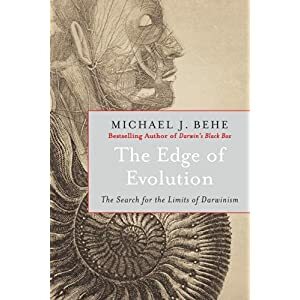 Michael Behe's The Edge of Evolution is one of the few books tackling this subject with hard, observable evidence. Behe, a professor of biological science at Lehigh University, made a huge splash in the intelligent design community with his ground-breaking Darwin' Black Box. Here, he follows up that work by looking specifically at the claim that "life on earth developed over billions of years by utter chance, filtered through natural selection." This book is different though, in that Behe notes that genetic mutational change preserved through natural selection is observable. If you have a large enough population that replicates quickly, you can look at if the population's genetics adapt to new environments and more importantly see if it created new features in the organism. In the book, Behe selects three very good candidates that provide data for us to follow: malaria, HIV, and e. Coli. Viruses and bacteria will reproduce on the order of millions in just a few days, and we know that each can evolve resistances to antibiotics. They have the added benefit of holding a much higher rate of genetic mutation that our cells do. Thus, they provide a perfect model to observe in a relatively short time how genetic mutation provides new benefits. But the key here, as Behe shows, is that while these and other more complex species (such as Behe's use of Antarctic fish whose blood doesn't freeze) can have genetic mutations produce some beneficial effects, it always comes at a loss of some other beneficial function. Behe offers the fact that malaria, which it can develop resistance to certain drugs, cannot evolve to overcome those with sickle cell anemia. Further, these changes are limited to relatively small differences. They cannot create entirely new functional systems. The Edge of Evolution contains some real numbers science can use when looking at the possibility of genetic change. When calculating factors for change, one must take into account how long it takes an organism or species to create a new generation, how many offspring it has, and its rate of genetic mutation. Each of these is known and uncontroversial. Therefore, scientists can observe the beneficial effects of change in something like a malarial virus or an E. Coli bacterium and see if new functions are actually being created, or if functions are merely being broken. Behe also extrapolates how much time would be required to accumulate enough changes to make new features in more complex mammals. As you can expect, the conclusion is not good for the blind watchmaker hypothesis. The Edge of Evolution is not a tough read, but there is some science in it. The biggest point the book has going for it is the observable data. Good science should be about the numbers we see, not the numbers we hope to see, and I think Behe here does a great job bypassing some of the conjecture and providing solid evidence that the neo-Darwinian model simply doesn't calculate. 1. Newport, Frank, "On Darwin's Birthday, Only 4 in 10 Believe in Evolution" The Gallup Poll 2/11/2009.Web. http://www.gallup.com/poll/114544/Darwin-Birthday-Believe-Evolution.aspx. 3/6/2012. "Further, these changes are limited to relatively small differences. They cannot create entirely new functional systems." "No doubt about it - the evolution of biochemical systems, even complex multi-part ones, is explicable in terms of evolution" This is not true. How does the system account for new information? How did the system begin? Modern biology: "The spontaneous appearance of . . . [RNA] nucleotides on the primitive earth “would have been a near miracle,” two leading researchers, Gerald Joyce and Leslie Orgel" - Definitively non-Christian, renowned scientists.